Our frequently asked questions will help you how to write a short story on Alter Stories. 1 Find your favorite stories based on genres. 2 To write a new Kickoff cq. Introduction or to see the latest published Kickoffs. 3 To see the latest published books or to start a new book. 4 Search with advanced search options. 5 To register your membership ot Alter Stories, only your e-mailadress is needed. 6 To login with your e-mail adress and password. 7 Wall of fame of the top rated stories. 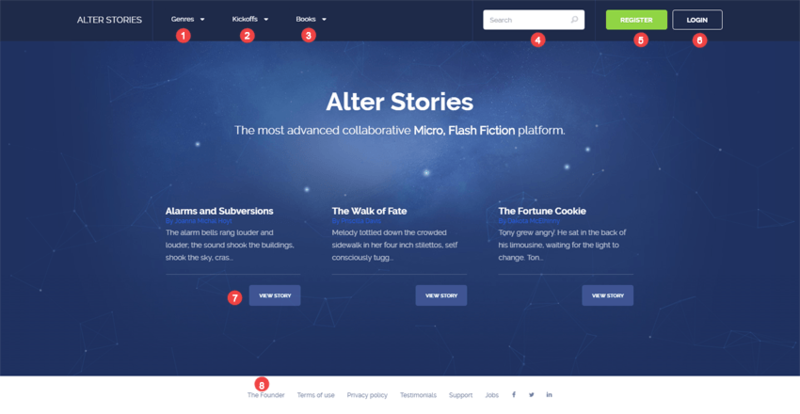 8 Footer links to help you spread the word of Alter Stories. 1 Important for community building, so upload a nice characteristic photo. 2 To visit the social media of your selected writer. 3 Activity Feed monitors your favorite writers and readers. 4 As a writers of a kick off you have the choice to select maximal three genre to your story. As a writer of a chapter you choose one of the selected three genres. Every chapter you can change between these three. 6 Shows writers, stories and storylines, you added to your Favorites. 7 Your workspace to store your writings in draft and published. 8 For your messages to and from your favorite writers. 9 To edit your profile, eg. your photo, description or social media links. 10 Who you are in ….. characters or less. 11 To return to your personal dashboard and workspace. 1 Switch to fullscreen and back. 3 A few characteristic words about your story. 4 Your space to write your story. 5 To select one to four keywords that the next author has to use. Keep in mind: the more keywords you select, the more challenge for the next author. Use alphabetic characters for your keywords. 6 To select three genres, not less and not more. 7 To save drafts of your kickoff / introduction. Keep in mind: your text is not automatically saved. 9 Add tags to label your story and improve the efficiency of the search function. Use only alphabetic characters for your tags. 4 You have to use the one to four keywords the preceding author has selected. 7 To save a draft of your follow-up. Keep in mind: your text is not automatically saved. 8 After 30 pages you can decide to finish the storyline. 10 Add tags to label your story and improve the efficiency of the search function. Use only alphabetic characters for your tags. 11 1500 characters to write your story. 3 To select finished stories. 7 Shows the awards you earned. 9 Scroll down or up the story. 10 Share story on Twitter, Facebook or LinkedIn. 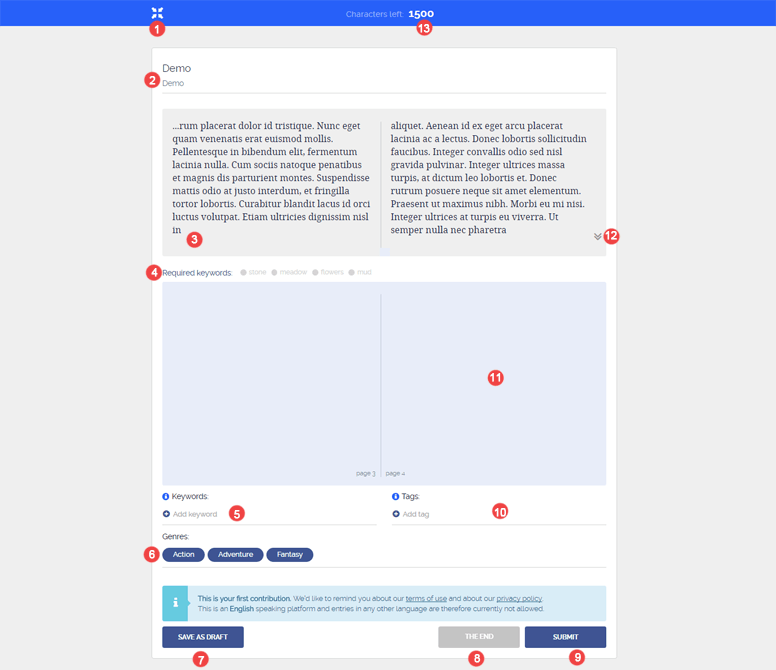 11 To add your favorite writer, kickoff, story or book to your personal dashboard. 12 To select the dyslexia view or use the report content function to send a report to the report center. 14 To return to your personal dashboard and workspace. 15 To bookmark the story. You find the bookmark on your personal dashboard. How can I register at Alter Stories? 1 Click the Register link. 2 Enter your Username and E-mail. 4 Click at Register for free, a confirmation mail is sent automatically to the e-mail adress you registered. 5 Look in your inbox for an email with the header ‘Confirm your registration’ from Alter Stories Support. 6 Open this e-mail, select ‘Click here to confirm’ to activate your account. 1 Go to your profile page and click on the Edit button to open the page at which you edit your profile. 2 Click the Add, Change or Remove button to edit your profile picture. 3 Upload a new profile picture from your computer. 4 Click the Save button to save your profile picture. How do I add social media links? 1 Go to your profile page and click on the Edit button to open the page at which you add your social media links. 2 Select one of the input fields and copy-paste your social media link. 3 Click the Save button to save your social media links. How do I use the Activity feed? 1 Select the user you want to follow. 2 Click on any story of that user. 3 Click ‘Add favorite’ in the menu. A submenu appears. 4 Select ‘Author’ in the submenu. How do I rearrange genres in my personal dashboard? 1 Click on the rearrange icon to drag and drop the block with your favorit genres to the top of the page. How do I bookmark a story? 1 Select the story and click in the top left corner ‘Bookmark for later’. 2 At your profile dashboard you click the tab ‘Bookmarks’ for the bookmarked stories. How do I use Favorites? 1 Select the story you like and click in the menu on ‘Add Favorites’. 2 Select in the submenu Author, Kickoff, Story or Books. 3 At your profile dashboard you click the tab ‘Favorites ’ for your favorit author, kickoff, story or books. 1 Use the Search field to find the user you want to contact. 2 Use Filter options ‘Authors’ , enter the name and click SEARCH. 3 The name of the author appears in the left column of the page. Click on the name. 4 Click in the next page on the button "Contact". 5 Enter a subject and your message and click SEND. 6 You will receive an email with the author’s reply to your message. Besides that you will find this reply in your personal dashboard under the tab "conversations". 7 7	Your icon shows an exclamation mark for any new messages. How do I write a kickoff/introduction? 1 Click on "Kickoffs" in the top menu and select "Start Writing" to open the page at which you write. 2 Enter Title and Description of your story. 3 Write the kickoff/introduction to the story in less than 4000 characters. 4 Add one to four keywords for the next writer. 5 Add one to four tags. 6 Select three genres for the next chapters of your story. 7 SAVE AS DRAFT if you want to review or continue later. 8 Click SUBMIT to publish your kickoff/introduction. —Try to catch ‘world into word’. 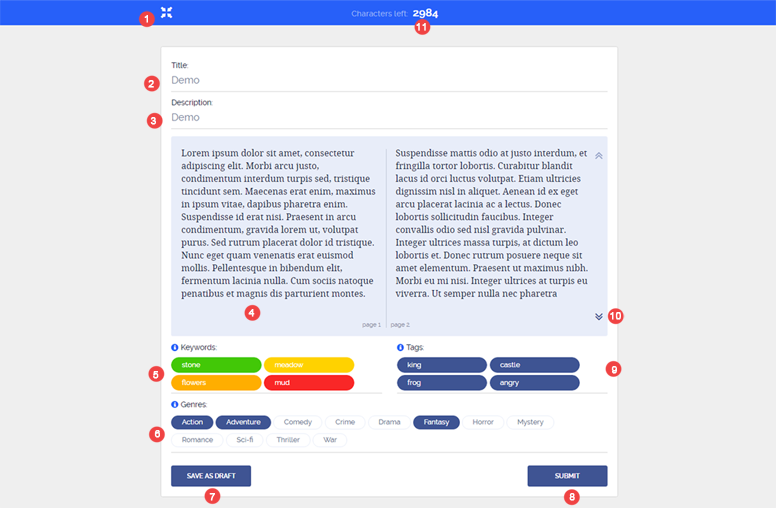 —Write short sentences with compact information. —Pull the reader into the story. —End with a cliffhanger to challenge the following writer. —Always check your spelling and grammar before you publish. How do I continue a story? 1 Clicking on the WRITE FOLLOW UP button under the story. 2 Read the required keywords for your story. 3 See what genres are selected for the story. 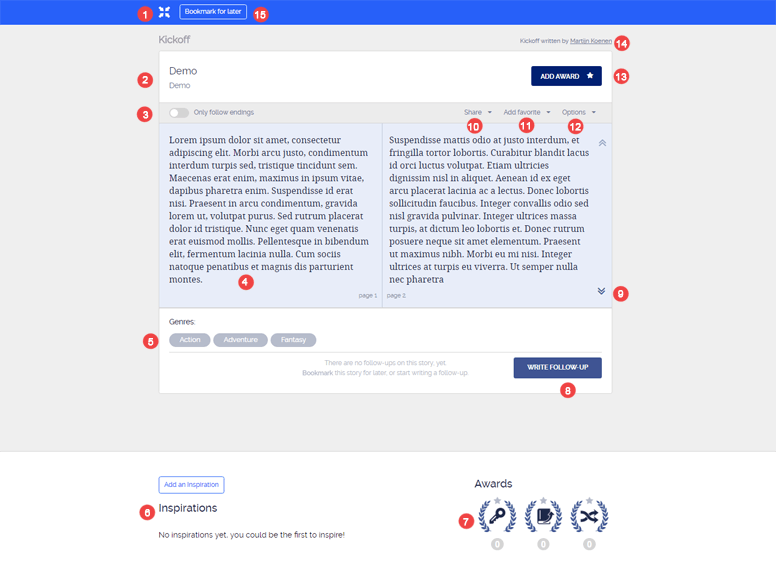 4 Enter your chapter with the required keywords in less than 1500 characters. 5 Add one to four keywords for the next writer. 6 Add one to four tags. 8 Click SUBMIT to publish your chapter. How do I publish my story automatically? 1 Go to your profile page and click on the Edit button to open the page at which you arrange to publish automatically. 2 Scroll down on that page and slide the button ‘Auto publish’ to the right. How do I use my workspace ‘My work’? 1 Go to your personal dashboard. 2 Click on the tab "My Work". 3 Here you find your kickoffs, stories and books in draft and published. Who owns the rights to my work? The information you store or process using the service is and remains your property (or the property of your suppliers or licensors). Works created through the service may also constitute joint works. This will be the case in the event multiple users make contributions to the same storyline. If you have submitted storylines, you may qualify for what we call Share in Future profits for more information please read our Terms and Conditions. How can I award writers? 1 Find a story that you think that earns a award. 2 Click on ADD AWARD to open the page with the awards you can choose. 3 3	Click on Keywords, Follow-up or Plot twist to select the type of award. After that click on ADD AWARD. How do I share stories on social media? 1 Click on ‘Share’ in the menu just above the story. 2 Select Facebook, Twitter or LinkedIn. How do I select the dyslexia view of a story? 1 Click on ‘Options’ in the menu just above the story. How do I add inspirations for the next writer? 1 Scroll down to the bottom of the page with the story. 2 Click on ‘Add an Inspiration’ to open a field in which you can enter your inspiration. 3 Click on INSPIRE to publish the tekst with your inspiration. If you have something you wish to discuss with us, please let us know as soon as possible. Contact us here report@alterstories.com or use our report system. You can read theTerms and Conditions here. Don't have an account yet? Register here. Forgot your password?